Poly (ADP-ribose) polymerase (PARP) is an abundant nuclear enzyme that mediates repair of DNA single strand breaks via the activation and recruitment of DNA repair enzymes. PARP activation rescues tumor cells from therapeutic DNA damage induced by chemotherapy agents (alkylating agents and topoisomerase I inhibitors). PARP repairs alkylated bases by recruiting scaffolding proteins (XRCC1), DNA ligases (DNA ligase III), and polymerases (DNA pol beta), and mediates base excision repair (BER). PARP activation in this setting is a basis for tumor resistance to chemotherapy. PARP inhibition, conversely, attenuates tumor resistance to alkylating agents and restores susceptibility of tumors to chemotherapy. As discussed above, PARP is required for efficient DNA repair of single strand breaks and BER. In the absence of PARP activity, DNA single strand breaks accumulate, degenerate, and form double strand breaks (DSB). Under normal conditions, DNA DSBs are repaired by homologous recombination (HR), a process in which both BRCA1 and BRCA2 proteins play a role. In the combined absence of PARP activity (via PARP inhibition) and HR repair (via BRCA1 or BRCA2 deficiency), DNA DSBs remain unrepaired, resulting in growth arrest and death of dividing tumor cell populations. Under physiologic conditions, PARP is constitutively activated at low levels and plays a role in housekeeping DNA repair functions, such as Base Excision Repair. Under pathologic conditions, however, wherein DNA damage is excessive (for example, from acute oxidant stress induced by physical trauma, toxin exposure, or ischemia-reperfusion), PARP is over-activated. Under these conditions, PARP enzymatically depletes its substrate (NAD), a critical molecule for cellular metabolism. 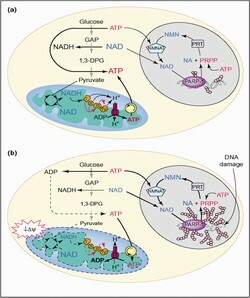 NAD is an obligatory cofactor for substrate-level phosphorylation (glycolysis) and oxidative phosphorylation (Krebs cycle, electron transport chain). In the absence of adequate levels of intracellular NAD, the cell cannot form ATP and therefore undergoes necrosis. In contrast to apoptosis, death by necrosis leads to the expulsion of cellular contents, leading to inflammation and further damage in surrounding tissues. Therapeutic PARP inhibition blocks oxidant-mediated NAD depletion, preserves cellular ATP, prevents necrosis, and protects tissues and organs from oxidant-mediated infarction.